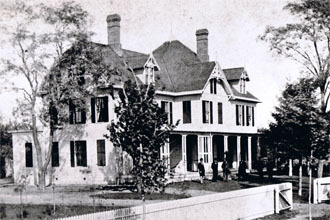 James A. Garfield, the 20th president of the United States, made his home at Lawnfield from 1876 until his death in 1881. Here he conducted the first “front porch” presidential campaign, giving speeches from the verandah. The many reporters camped out on the lawns around the house gave the property its name. Garfield was a leader of the Radical Republicans in the House of Representatives when he received the nomination as a “dark horse” candidate for president in 1880. He began his presidency with attacks on political patronage and corruption, but his assassination by a deranged office-seeker cut short what might have been a vigorous administration. He was shot twice in the back on July 2, 1881, and endured two months in agony before dying on September 19. 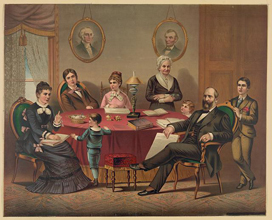 Born in 1831 in a log cabin in Orange Township, Ohio, James A. Garfield surmounted poverty by hard work and study. He attended the Western Reserve Eclectic Institute (later Hiram College) and graduated from Williams College in Massachusetts, with honors. Strong interests in religion and education led Garfield to become a teacher, college principal, and lay preacher, all by the age of 28. He married Lucretia Rudolph, a childhood friend, in 1858; they would have five sons and two daughters. The same year he won a seat in the Ohio Senate, running on an anti-slavery platform. In 1861, he entered the United States army as a lieutenant colonel of volunteers. With no previous military experience, he advanced to brigadier-general by March 1862. Garfield was elected to the United States House of Representatives in November, 1862, but stayed with his troops until December, 1863, when the 38th Congress convened. Garfield served 17 years in the House of Representatives. A leader of the Radical Republicans, he believed strongly in a stern Reconstruction and conservative hard money economic policies. He was one of many members of Congress peripherally involved in the scandals of the Grant Administration but emerged relatively unscathed. He also served as one of the Republicans on the commission that awarded Rutherford B. Hayes the presidency after the contested presidential election of 1876. Garfield purchased his farm in Mentor, Ohio in 1876, while he served in the House of Representatives. He wanted a place where he could, “put my boys at work and teach them farming” and “where I can touch the earth and get some strength from it.” An enthusiastic farmer, he spent many hours conducting agricultural experiments. He soon began to expand the original one and one-half-story frame house on the property to accommodate his large family. Between 1877 and 1880, Garfield and his wife, Lucretia, enlarged their home from nine rooms to twenty, added a porch across the front, and refurnished the interior. At the Republican Convention in June 1880, Garfield won the nomination for the presidency on the 36th ballot as a “dark horse” candidate. He conducted much of his successful and precedent-setting "front porch” campaign at Lawnfield. Garfield maintained an office in the main house, which Lucretia called his “Snuggery,” for private meetings and conversations. He converted a small building formerly used as his personal library into his campaign headquarters and equipped it with a temporary telegraph to send and receive messages, including the results of the election. He entertained an endless procession of visitors. The Lake Shore and Michigan Southern Railroad, whose tracks ran across the farm, routed special excursions to Mentor and set up a stop at Garfield Lane, the pathway leading to the house. As president, Garfield hoped to reunite the Republican Party, which was split into two factions over personal differences and the distribution of political appointments. Much like his predecessor Garfield supported inquiries into corruption even among his own cabinet members, winning high marks from reformers. A scholar at heart, he sought to create a Federal department of education and served as a regent of the Smithsonian Institute. He did not live to achieve his hopes of reforming the civil service and fighting inflation. 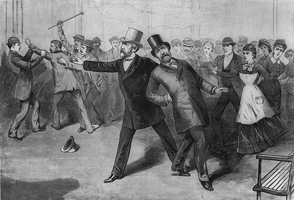 On July 2, 1881, only months after his inauguration, Charles Guiteau, a disgruntled office-seeker, shot Garfield twice in the back. After struggling for his life for two months, Garfield died on September 19. Using money donated by the American public in memory of the martyred president, Mrs. Garfield transformed Lawnfield into a memorial to her husband, as well as a country estate and a place to enjoy her children and grandchildren. She added a new wing to the house that included a library and vault to protect her husband’s papers. The family continued to own Lawnfield until 1936, when they donated it to the Western Reserve Historical Society. The site today is managed by the National Park Service. The first two floors have been restored to the period when the Garfields lived in the house. First floor rooms include an entrance hall and a reception hall, James and Lucretia Garfield’s summer bedroom, a parlor, dining room, and Grandma Eliza Garfield’s bedroom. A stairway from the hall leads up to the Memorial Library. White oak and an ornate beamed ceiling make this an impressive room, commemorating James A. Garfield’s love of books. Restored outbuildings include the library/campaign headquarters. The James A. Garfield National Historic Site is located at 8095 Mentor Ave. in Mentor, OH. The estate has been designated a National Historic Landmark. Click here for the National Historic Landmark registration file: text and photos. The visitor center in the carriage house contains exhibits and an auditorium with a short film on Garfield’s life. Tours of the main house run regularly but may be limited. Call for a schedule. An admission fee is charged. For more information call 440-255-8722 or visit the National Park Service James A. Garfield National Historic Site website. Lawnfield has been documented by the National Park Service’s Historic American Buildings Survey.